Susan Cox checks 6-year-old Stephanie Brandon’s recitation of “The Lord’s Prayer” at Medina First United Methodist Church in Tennessee. Soon after retired schoolteacher Shirley Barber taught the first-grade Sunday school class at St. Luke's United Methodist Church in Memphis, Tenn., she recommended the church begin presenting Bibles to first-graders, rather than waiting until the children reached third grade. The children's ministry team agreed and chose Adventure Bible [Zondervan], a New International Version divided into books, chapters and verses that use language familiar to children. Miles Masters, son of the children's ministry director, Beth Masters, was in the second group of younger children receiving Bibles. "He really reads it!" she says. "It's fascinating to see how much more interested he is in reading his Bible than (were) children who received (it) in third grade." As more children are learning to read earlier, some United Methodist congregations are presenting Bibles and introducing youngsters to the biblical text at an earlier age. Barber, who distributes early-reader Bibles to the children she teaches at St. Luke's, believes, "Children are ready to be exposed to the Bible before third grade. That's my passion." At West Bethel United Methodist Church in Cedar, Minn., first-graders, who are starting to read, help the younger ones through the Bible story during Sunday school, says Amber Brown, volunteer children's ministry director. The church, which averages 60 people in worship, now presents second-graders with The Children's New Revised Standard Version Bible [Abingdon Press]. It also has the biblical text in books, chapters and verses as well as summaries of familiar stories. West Bethel teachers and parents led by Karen Evenson, a Christian educator and student assistant to the pastor, designed their own curriculum. The team brainstormed themes to emphasize more familiarity with the Bible, correlate with the sermons and be important to young families. The team encourages families to bring parents and children together to discuss the Bible stories both have heard. Sunday school attendance has grown and is more consistent. "At the beginning of every session, children find where the scripture is," Evenson says. "The kids are excited!" "Parents were impressed that their children could summarize the story and repeat it back," Brown adds. The Bible stories are written to be told and shared, says Melanie Gordon, director of Ministry with children for the General Board of Discipleship. "For very young children, it's more important to know what the story means in the way we live our lives." When adults are concerned about children reading the more graphic parts of the Bible, Gordon advises, "Know where the scary parts are. Read ahead and understand that some stories are not nearly as scary as we think they are for children. Know your children — that's the key." At St. Luke's, Barber tucks copies of the King James Version of "The Lord's Prayer" in the backs of the Bibles she distributes so children can participate in the worship liturgy. 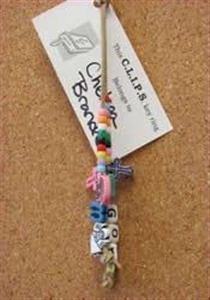 Children add beads to their CLIPS key chains as they successfully memorize prayers and scriptures at First United Methodist Church in Medina, Tenn.
Medina (Tenn.) First United Methodist Church developed CLIPS (Children Learning Important Prayers and Scriptures), an at-home program in which 3- to 12-year-olds memorize scriptures, prayers, the books of the Bible and even the Apostles' Creed. Children recite age-appropriate memory work to volunteer listeners between Sunday school and worship, explains Rebecca Brandon, who chairs Medina First's children's ministry team. As youngsters learn the items, they earn beads for a key chain. "I love that my daughter is learning things that we use in the church service along with information about the Bible itself," says Medina member Traci Tate. "Children should be familiar with passages that really sustain us," Gordon agrees. "'The Lord's Prayer,' for instance, is sustaining for children and adults through their lifespan." This article first appeared in the July/August edition of The Interpreter Magazine. For a list of Bibles and other children's ministry resources recommended by Melanie Gordon, director of children's ministries for the General Board of Discipleship, visit ministrywithchildren.wordpress.com/elementary.